D1. 2" Wide Agitation Collar. Made of double thick pliable latigo leather with nickle plated steel buckle and D ring. The D is in front of the buckle so it pulls against the whole collar not just one layer. Heavy Steel Buckle and D ring are double stitched for extra strength. Great for tracking, agitation work or as a super tie out collar. Fits Necks 14"-18" Fits Necks 16"-20" Fits Necks 18"-22" Fits Necks 20"-24" Fits Necks 22"-26" Fits Necks 24"-28" Fits Necks 26"-30"
D2. Box Style Agitation Muzzle. 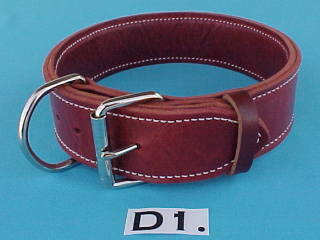 a 1" wide stiff leather renforcement strap in the front. growl, pant and fight without biting the agitator. a loop under the chin to slip a regular collar through for added safety. D24. Black Nylon Agitation Harness. It has metal snap together buckles that make it easy to put on. It has a fleece lined leather chest pad that to protect dog and encourage pulling. The pad has straps with snaps to make it easy to change for tracking. with solid brass buckles and rings that won't rust for long life. dog freedom to put his head down and track. It has 4 buckles to fit your dog properly.